The GO! Outfitters tarp in porch mode. The GO! Outfitters Tarp is generously sized with multiple side tie-out points that make it a versatile shelter option for hammock camping and other outdoor adventures. I was sent a pre-production prototype to preview before the tarp goes out for Kickstarter funding in January 2016. Manufacturer: GO! Outfitters, made in China. The GO! 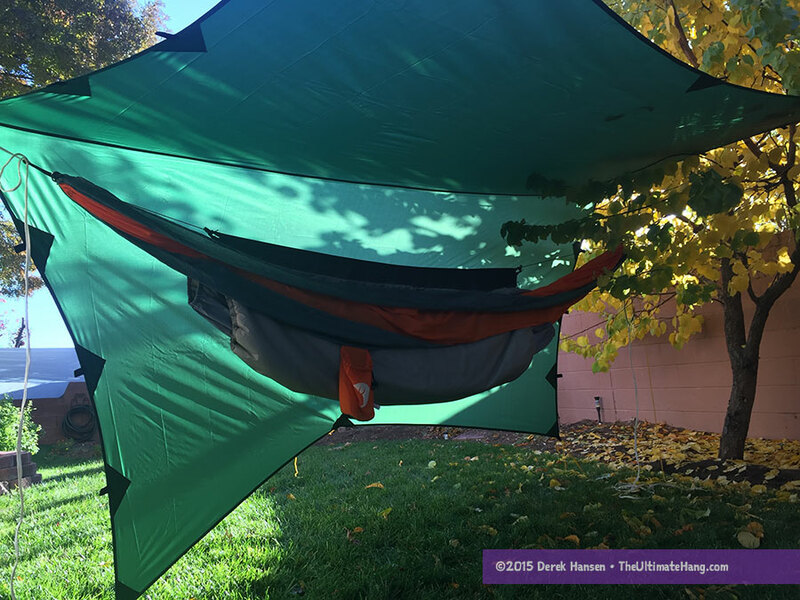 Outfitters tarp has a slight hexadecimal shape with catenary-cut edges, which creates parallel coverage over the hammock with tapered side panels. The cat-cut edges help ensure a taut pitch in windy conditions. The tarp has numerous side pullouts that provide opportunities for this tarp to be pitched in a variety of ways. The wide side panels provide a lot of protection and make this tarp a great winter tarp option. 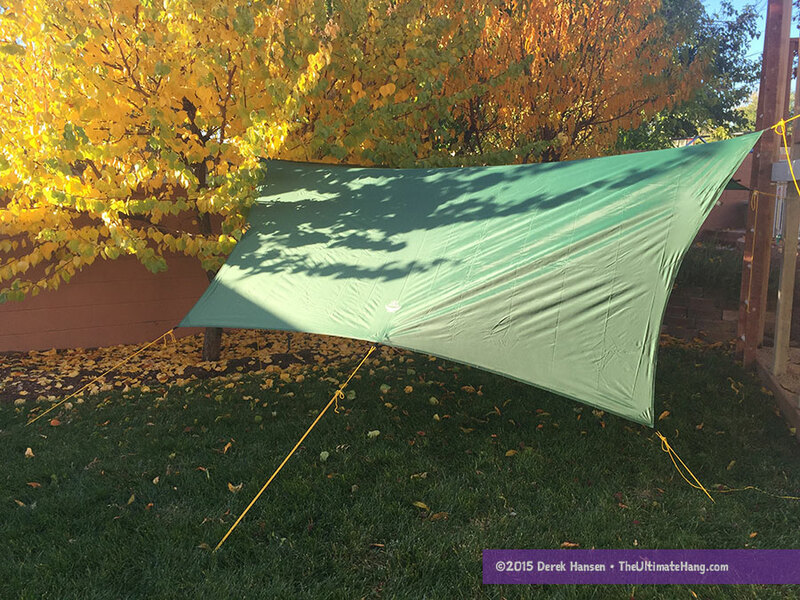 The tarp comes with several lengths of guyline, enough for the ridgeline and the four main corners, as well as a few more tie-outs so you can customize the pitch how you like it. The packet I was given also included several basic steel pegs. Jason, the owner, told me he plans to incorporate corporate philanthropy for each tarp sold during and after the Kickstarter campaign to provide clean water for a person in need for an entire year. Be on the lookout for these and other details when the campaign launches in January 2016. This past year I’ve been testing and using a lot of small, narrow tarps, so using the GO! Outfitters tarp was a welcome change. It is a large tarp with wide side panels that made it easy to make an enclosed shelter. I also used the tarp in a porch mode where one side was pegged down steep to the ground and the other side was open wide for views. The midpoint tie-outs on the side panels also allowed me to pull in the ends to close up the ends; a pseudo-door technique. There are three midpoint tie-outs on each end. At first this seemed a bit excessive, but it does allow the ends to be tied or clipped together to seal off the end. The multiple tie-outs make this tarp a workhorse. I usually pack PU-coated polyester tarps the same way: folding. Perhaps less convenient than just stuffing (which is easier with silnylon tarps), folding keeps the packed size really small. I hand-wrap each of the guy line to prevent tangling. The guyline is a little spongy, which is typical for low-price line. Polyester tarps don’t have the stretching problem that silnylon- or nylon-based tarps do, so having line tensioners isn’t as important. After several days of using this tarp, I didn’t have any issues with the tarp sagging or drooping, even with the included guyline. You may want to upgrade the line, but it isn’t necessary for performance issues. GO! Outfitters included small plastic line tensioners with each line, but I didn’t use them. In fact, they were the first thing I removed once I got the tarp put together. Instead of the hardware, I used common Scouting knots: Bowline, Taut-line hitch, and the Trucker’s hitch. The prototype I was sent is very well made with straight stitching, even lines, and no stray string or loose fibers anywhere. The build quality and material on the tarp are very good. The guy line is a little stretchy and lower quality as I mentioned, but they are serviceable. Each guy point is reinforced and uses a small webbing loop as the attachment point. I used this tarp over multiple days and even pitched it through some tree branches (see inset photos) and the tarp held up to the wind, precipitation, and abrasion without complaint. This is a very versatile tarp that can handle summer storms and winter blasts. It’s great for folks looking to get a single tarp that can “do everything” without breaking the bank. The extra tie-outs make allow you to really configure this tarp in a variety of ways to suit environmental conditions and personal taste. How can this only be “130 X 51” and look as above? The ridgeline is 130 inches long. The side panels are 51 inches wide. Double that if you want the full width. Not yet. They haven’t officially launched it yet. More details will come in January. Would you mind letting us know when you hear about the launch? This launched earlier today on Kickstarter. 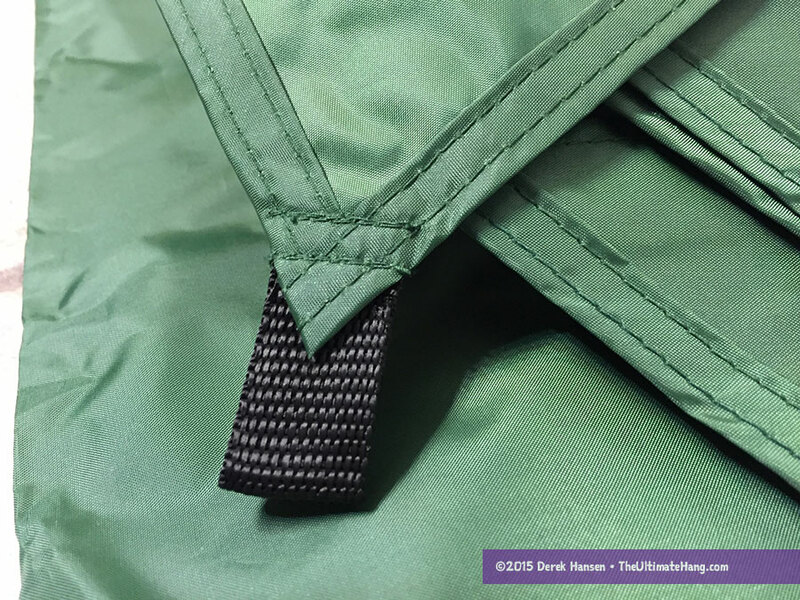 It’s coated polyester so it is heavier than silnylon, which is a common backpacking tarp. If weight is your primary consideration than a sil tarp is a good middle ground for weight and price. The next tier for weight is Cuban, but the price goes up considerably. That said, this tarp is still a good option for backpacking. It can pack down pretty small for the amount of coverage it provides, if price is more of a consideration.